Since we are a relatively small money management firm, it is critical that we spend the vast majority of our time focusing on the most relevant factors related to successful investing. Consequently, our intent is to master proven and consistent methods which can improve the odds of investment success. Since most policymakers, business commentators, and finance professors have never managed money, their economic forecasts and financial theories may offer little help in terms of how to allocate investment capital. Books written by or about successful money managers who have consistently used systematic technical and fundamental methods to produce favorable outcomes are the most helpful in our quest to become better investors. The range of possible topics to cover in an annual investment outlook is almost unlimited. This “outlook” covers topics that can help improve the odds of making money in 2009. Conversely, these topics can also help decrease the odds of losing money in 2009. Our approach looks for fundamental and technical alignment when making investment allocation decisions. From a fundamental perspective, our focus is on macroeconomic trends and government policy. On the technical front, we will focus on the current state of the markets and possible sources of leadership in 2009. The third major element in any sound investment program is a disciplined and repeatable process to evaluate alternatives and manage risk. Since all investments involve opportunity costs, it is important to compare and rank investment alternatives. Our basic investment philosophy focuses on asset classes and their relative attractiveness. Given the state of the economic landscape and unprecedented actions from policymakers, we have broadened our scope of investment options to include individual stocks. Adding individual stocks allows us to more easily identify the major investment themes that are driving the markets. Many of these investment themes can be worked into our strategy using an asset class by investing in an index or specialty exchange-traded fund (ETF). In some cases, we may be better served to gain exposure to an investment theme via an individual stock or bond. 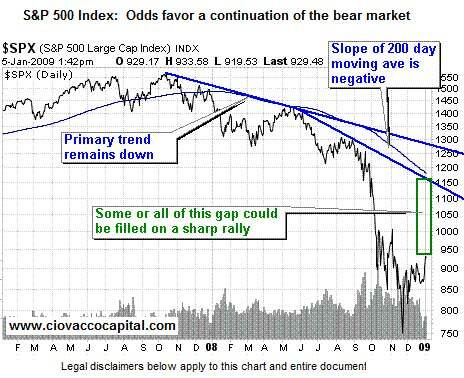 Despite recent gains, almost all major financial markets remain firmly in downtrends as we enter 2009. Some signs of technical improvement have come in recent weeks, but little to no change has occurred yet in long-term trends. Our screens and preparation for 2009 should not lead you to believe that all is well and money is surely to be made this year. Prudent and conservative entry and exit points for all investments will continue to be an important part of our risk management process. In simplified terms, we will hold on to winning investments and prudently cut losses on the inevitable poor performers. We will also be patient with entry points rather than blindly chase what easily could turn out to be a bear market rally. We are concerned about our performance over the next several years, not the first two weeks of 2009. When a new bull market finally arrives in some asset classes, there will be ample time to profit from the trend. A few positive early signals have been given, but not enough to declare an end to the bear market. We have covered this topic for years, so there is nothing really new in this area except the alarming increase in the pace of the government’s printing presses and ever-expanding scope of market intervention. A recent review of this theme can be found in Does The U.S. Government Print Money? and on this Weak U.S. Dollar page. Stocks of gold and silver mining companies (GDX, RGLD) and physical gold (GLD) and silver (SLV) scored well in the rankings. At the present time, the stocks appear more attractive than the physical metals, but that is subject to change in the event of further stock market losses. With financial deleveraging still taking place, the vast majority of investments, including those outlined here, carry above average risk. These investment themes and possible investment options were complied to help us be better prepared in the event the markets begin to focus on inflation rather than deflation. They are not presented as “buy at the market and hold them for 2009” ideas. Numerous stocks and ETFs related to this theme scored well in our technical ranking system - please see Chart One at the bottom of the page. Although slowed by economic realities, demand for all goods is being created as more and more people around the globe migrate from poverty and the lower class to the lower-middle class. Expanding opportunities in Asia are helping people trade in bikes for cars. Access to better wages means moving up a rung on the economic ladder, which creates demand for more nutrient-rich foods, and consumer goods. This trend is a long-term driver for commodities. From a supply standpoint, the current credit crisis and economic downturn have caused many commodity producers to cancel capital-intensive projects. When the global economy improves, we may be looking at high commodity prices in short order. Government policies around the globe are pumping the financial system with fiat currencies. Once some of this money makes its way through the system, it will put additional upward pressure on all prices, including commodities. Clean energy and green technologies are a subset of this theme. We can expect the government programs theme to provide support to environmentally friendly solutions in all fields. Since commodities are "hard" assets, they offer a way to protect investors from a weak dollar, increases in the money supply, paper currencies, inflation, etc. 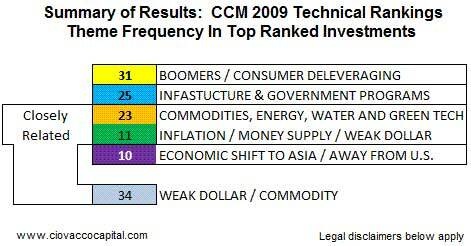 Therefore, the weak dollar and commodity themes are somewhat interchangeable. In line with the natural laws of the universe, the NFL’s once dominant New England Patriots missed this year’s playoffs. The Pats had a good year, but not as good as in recent years. Contrary to popular belief, global power also shifts according to natural laws. Changes in demographics, regulatory structures, technology, and countless other factors all point toward a gradual decline in America’s global power. Britain was once the king of the hill and the pound was the world’s reserve currency. Over time, power slowly shifted to the United States. The U.S. dollar replaced the pound as the world’s reserve currency. A similar gradual shift is taking place today with power migrating toward Asia. While the timing is uncertain, the U.S. dollar one day may cease to be the preferred medium of exchange. In the unlikely event you had not noticed, the U.S. government now has an active role in the future of banks, insurance companies, automobile manufacturers, and brokerage firms. Numerous stakes have been taken and guarantees made. The Obama administration is working on a stimulus package which includes spending on roads, bridges, and other infrastructure. The infrastructure package may pump between $850 billion to $1 trillion into the economy. While economic fundamentals remain very concerning, we cannot ignore massive amounts of government spending; especially from a government that can seemingly print an endless supply of new money. We are rapidly moving into a period of "big government". Therefore, any company, sector, or asset class that can benefit from the expansion of government is related to this theme. Credit helped fuel the age of consumerism. Americans, and many foreigners, shifted from a "depression mentality" to a "McMansion mentality". This trend was sustainable when the baby boomers were in their prime earning years. It is no longer sustainable as the baby boomers head to retirement. The recent massive destruction in wealth caused by falling stock and home values may have served as a wake up call. The baby boomers may now realize saving is not such a bad idea. As personal savings increase, personal consumption and spending contracts. When consumers pull back their wallets, economic growth and output will suffer. This new trend is largely based on demographics, which cannot be altered by printing money or building bridges. The boomer theme also relates to the increased demand for health care, pharmaceuticals, and any product or service that can assist an aging population. Later in this outlook, we cover the process of deleveraging, which involves paying down debt. While the boomers represent the primary driver for this theme, consumers of all ages will have to make smarter purchasing and savings decisions in a weak economy where access to credit is limited, job security is diminishing, and net worth was hit with falling stock and home prices. The boomer/deleveraging theme is somewhat of a weak economy theme as well. For example, tobacco products and beer are considered to be recession proof since people will still smoke and drink even in a down economy. The big picture fundamentals remain concerning. Below we outline some other possible drivers for asset prices in the coming years. It is important to understand, long-term rallies can take place in asset prices even in the face of poor fundamentals. In order to better understand where we are today and what the future may hold, it is important to review how we got into the current economic mess. Access to and the use of credit were key drivers of financial market gains in both the 1982-2000 and 2003-2007 bull cycles. Structured investment products, which bundled everything from student loans to commercial loans, helped fuel a rapid expansion in the availability of credit. Federal Reserve policy also contributed to an increasing dependence on more and more credit. Easy access to credit led to the widespread use of leverage. Leverage is the process of borrowing money (levering up) to purchase all types of assets, ranging from securities to commercial real estate. All types of assets, from stocks to residential housing, were used as collateral for more and more loans. More money, via access to credit, created more demand for all assets. As demand for the assets increased so did their value. When the assets increased in value, so did the value of collateral to borrow against. Money managers used rising stock prices as a source of new collateral to borrow against. They borrowed more and bought more stocks, which created even more demand. Real estate investors borrowed against existing properties so they could buy additional real estate assets. It all worked very well as long as the value of the assets used as collateral continued to increase or at least stayed relatively stable. Leverage ratios expanded as the prices of all assets, from classic cars to vintage violins, kept going up. When asset prices began to fall in value, the "leveraging" process across the entire economy shifted to a "deleveraging" process. Leveraging involves borrowing more and buying more assets. Deleveraging involves paying back loans, often with money raised from the sale of assets. As the value of assets fall, collateral falls. When collateral drops, capital calls are soon to follow. Just as leveraging created demand for assets, deleveraging drives the need to sell assets. You have probably heard the terms "forced selling" or "forced liquidation". When everyone is leveraging, it creates buying pressure. When everyone is deleveraging it creates selling pressure. Increased buying pressure leads to higher prices of assets. Increased selling pressure leads to lower asset prices. Lower asset prices lead to more collateral calls, which lead to even more selling. And around and around we go until equilibrium is reached between the need to sell and the desire to buy. The process of selling to meet collateral calls, which in turns puts even more pressure on asset prices, is often referred to as a "deflationary spiral". We mentioned above that structured investment products greatly increased the availability of credit. The structured investment products pooled loans and sold the loans to numerous investors in the form of securities. As you might imagine when default rates pick up on loans, the value of the securities backed by the loans drops. After the downward spiral in assets prices started, investors in securitized loans lost a lot of money. When investors lose money, they are less inclined to line up for the new offerings of securitized loans. Thus, a giant source of capital for the credit markets has dried up. If you cannot borrow, you cannot use leverage in the same way you once did. The deleveraging process has negatively impacted the prices of almost all asset classes from oil to corporate bonds. Selling securitized loans was big business on Wall Street. The use of leverage in "proprietary trading" at all the major investment firms enabled them to lever up their investment gains in good markets. In declining markets, the use of leverage magnifies losses and can take down a firm the size of Bear Stearns or Lehman Brothers. Securitized loans and proprietary trading were a major source of revenue for financial firms. These cash cows are not coming back anytime soon, which means earnings expectations for all financial companies will have to come down significantly. Lending institutions wrote numerous bad loans during the bubble years. Now that loans are defaulting at increasing rates, regulators are calling for higher loan loss reserves (a little late). Higher reserves mean less money to lend. Less money to lend means fewer loans and lower profits for banks. Financial stocks were a major driver of investment gains in recent bull markets. It is doubtful at best financial stocks will lead us into the next bull market. The number of previously owned homes for sale at the end of November 2008 would require 11.2 months to sell at the current pace. Healthy markets have roughly 6.0 months of unsold inventory. Home prices will continue to be under pressure. Home values are tied to all sorts of collateral for loans. As prices decline, it adds more fuel to the deflationary spiral. Be careful to differentiate between projections of prices paid, sales, and housing starts. Until prices paid can stabilize, we cannot see the light at the end of the tunnel. Although it moves us in the right direction, increased sales at lower prices is not what we need. Wall Street compromised their integrity by selling many "safe" investments to institutions and individuals. The rating agencies told them it was all "AAA-rated". When the leveraged house of cards came crashing down, investors were left with illiquid and sharply devalued securities. It will take years, if not a generation, before investors forget about Wall Street’s greed and incompetence in the area of risk management. The times of borrowing our way to prosperity may be coming to an end. The U.S. government and consumer have been borrowing almost at will in recent years. Foreigners have been happy to lend us money so we in turn could purchase their relatively cheap manufactured goods and oil. As America’s ability to repay is no longer as certain as it once was perceived to be, foreigners have already begun to question the wisdom of making loans denominated in U.S. dollars. The combination of the bursting of the global credit bubble and graying boomer population have changed the risk parameters of blindly funding America's consumption habits. As the risks increase, lenders will at some point begin to demand higher rates of return on their loans, which means higher interest rates in the United States. Higher interest rates in an economy built on debt is not a reason for optimism. At some point in the future, shorting U.S. Treasury bonds may be a trade with strong fundamental support (we just need to wait for technical alignment). Unsustainable imbalances are also present in the Medicare and Social Security systems. Something has to change. Many Americans are unaware that similar demographic problems are present in numerous developed countries. Access to credit enabled developers to build a little slice of "Generica" in every corner of our cities and towns. Riding down the road in Dallas looks much the same as in Atlanta. We can use our gift cards at Starbuck’s, Best Buy, or Chili’s. The weak state of the economy and rapidly deteriorating consumer spending have put fear into the hearts of Generica’s retailers, many of whom are saddled with high debt. Expect to see less construction and more vacancy signs as retailers disappear or choose to exit certain markets. The depressed economy is already hurting many of the thousands of golf clubs built since 1990. While the deals on golf memberships are certain to be appealing, the default rates on club loans will not be. Many talking heads point to "once in a lifetime opportunities" based on current stock valuations. While we agree with the positive case that can be made based on the November 2008 lows, we also understand historical valuations also could point toward the S&P 500 hitting bottom around 600 (35% lower than the 01/02/2009 close). Valuations have fallen to a point where keeping an open mind about further gains is prudent, but not to a point where it is time to blindly become fully invested. Current valuations can be termed as moderately attractive based on history and normalized earnings. When the charts point toward an improved environment, we can then argue we have some reasonable fundamental and technical alignment. Regardless of your political inclinations, it is apparent President-elect Obama possesses remarkable political skill. Keynesians are going to have their day in the sun as President Obama plans to stimulate (spend) like you have never seen before. Popular opinion says the new administration can reverse the current negative spiral and get everyone to start spending again. We certainly understand this theory and it may indeed work, at least for a while. However, a prudent investor should examine both sides of any argument. The other possible outcome after the administration’s initial honeymoon is one of great disappointment. All politicians are skilled at making campaign promises. Mr. Obama has talked about “changing the world”, which is an admirable goal. With the current secular trends firmly in place, “changing the world” and spending our way to prosperity may be a tall order. The same comments would apply if John McCain were moving to Pennsylvania Avenue. If you think Americans are down now, consider how their fragile psyche will react to the possible realization the new administration cannot pull a miracle out of their policy hat. This is neither a prediction, nor a forecast, just one of many possible outcomes. It didn’t work. The results were double digit inflation, budget and trade deficits, and a general decline in the standard of living. Unemployment hit 10%. The franc declined in value relative to other currencies. (SOURCE: Trader Vic by Victor Sperandeo). The 1990’s are known as "the lost decade" in Japan. Fueled by credit expansion, Japan had bubbles in stocks and real estate (sound familiar?). After the bubbles burst, rather than come clean about bad debts, investments, and decisions, the Japanese tried to assist aligning companies with loans. Still saddled with problems many companies were referred to as "zombie firms" since they remained in business, but in a depressed and unhealthy state. Japan did not purge the bad debt and investments from the system. U.S. policymakers have made similar mistakes by helping firms cover-up and hide bad debts and assets with bailouts, loans, and changes in accounting rules. If you are going to print money, provide loans, or intervene in the economy, it is better to do so sooner in the economic downturn rather than later. U.S. policymakers have done that starting with early interest rate cuts in 2007. This is in stark contrast to the almost non-existent initial reaction in Japan and cannot be ignored when making comparisons to the two periods. While unlikely in 2009, in the coming years we may see a growing global resentment toward policymakers and business leaders who drove the economy and financial system into a ditch. A few more years out, tensions will surely be high as inevitable changes are made to Medicare and Social Security benefits. Higher taxes in a weak economy may add to the typical family’s frustrations of trying to make ends meet. Doing "The Easy and Self-Serving Thing"
Where were the whistleblowers on Wall Street? Who took a stand at the rating agencies and said, “This is wrong – these are not AAA-rated securities”. Where was the conscience of the real estate appraisers, mortgage brokers, and loan officers who in many cases were involved with fraudulent loans in order to line their own pockets? Why didn’t Congress have the political will to deal with the known problems at Fannie and Freddie before they helped bring down our financial system? Why didn’t the Federal Reserve stop its bubble-blowing machine before it was too late? Where was the leadership in the corporate CEO’s office and boardrooms on Wall Street? Why is a recession or company failure unacceptable? Why did policymakers pull out all the stops over the last decade to avoid a recession, which helps clear bad debt and bad decision makers from the system? Why is it acceptable to “walk away” from your mortgage even though you promised to pay? What ever happened to doing the right thing? What happened to working hard, saving your money, and buying things when you can afford them? The concern here is many of the political leaders, CEOs, boards, and market participants who should answer these questions remain employed or in power. We should be concerned about their ability to lead us out of this economic mess. Money managers are risk managers, which necessitates being skeptical of all the financial cheerleaders and politicians that keep telling us everything is fine. The United States remains the best place on the planet to have a good idea. Our small investment firm is but one example of the great opportunities available to American citizens. Our freedom has always been and remains our greatest asset. My hope is that during these difficult times our leaders will “do the right thing” even if it means enduring a little political or economic pain. We have outlined numerous concerns about the economic outlook for the United States. Investors, especially currency investors, should keep in mind many of the problems in the United States are also present in other countries, developed and emerging. If you are down on the U.S. dollar, that means you have to be bullish on some other currency. Currency debasement (money printing) is taking place all over the globe. All major currencies are fiat currencies. High debt levels are not confined to the United States. Demographic and entitlement problems are common in other developed nations. Poor leadership and corruption are not unique to our country. 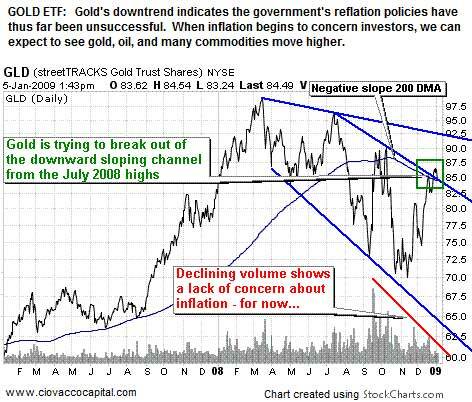 In the long run, the best protection against inflation may be with “harder” assets, such as gold, oil, agriculture, etc. rather than taking stakes in other flawed paper currencies. The recent synchronized global economic boom had never been seen before. Likewise, the synchronized intervention by global governments has never occurred before. Liquidity is being pumped into the global financial system from every corner of the globe. We must be open to and prepared for the possible reflation of asset prices, which includes stocks, bonds, and commodities. If you consider some of the “false gains” created by credit expansion in the 2002-2007 bull market, you become more open to the possibility of the successful reflation of asset prices via the printing press. Blackjack is a game of odds. You reduce risk when the odds are against you and take on more risk when the odds are in your favor. Good blackjack players continually reassess their odds as more cards are turned. Good blackjack players are very observant of changing conditions. Money management requires similar skills. As conditions change, the odds of success or failure change. The current environment has a lot of moving parts, which means we must pay close attention to changing fundamentals, technicals, and government policies. In my wildest dreams did I believe the U.S. dollar would be one of the best investments in 2008? Did I correctly forecast the rush of money into U.S. treasury bonds in 2008 even as the government printed money night and day? Did I think the NASDAQ bubble would continue to inflate from 1998 into 2000? The sooner you concede no one can consistently forecast outcomes in financial markets, the better off you will be as an investor. You may be 100% correct on the fundamentals, but it is the timing that is nearly impossible to forecast with any consistency. The bearish case for the U.S. dollar was strong in 2008, but there were many other factors at work which drove the dollar higher (factors that many missed). The NASDAQ was overvalued in early 1998, but it also made eye-popping gains from 1998 through March 2000. Why did we exit our weak dollar investments in 2008? Because the market told us to exit. It had nothing to do with anyone’s forecast or view of the economic landscape. If the market tells us to again invest based on dollar weakness and the reflation of asset prices, we will take action. Many excellent analysts forecasted the bursting of the credit bubble in the late 1990s. Unfortunately, many of them were early with their forecasts and consumed with a singular theme. As a result, they missed the entire 2003-2007 bull market. Many well-known Elliot Wave gurus have been calling for the end of civilization as we know it since 1987. They missed all the gains from 1987-2000 and again from 2003-2007. In today’s environment, many investors are singularly focused on the weak dollar theme. We strongly support the weak dollar theme, but know it is one of many drivers of asset prices. It may turn out to be the central theme, it may not. It can also be detrimental to become focused on a single stock or asset class. "Gold bugs" are known to be continuously bullish on gold. We agree with the case for owning gold, but also know many investors who have suffered great opportunity costs sitting in gold as other asset classes outperformed significantly. We are confident some of the themes we believe in will lead to profits and some of the assets classes we follow will generate positive returns. We are not overly concerned with which themes work and which asset classes make money. We are concerned about having exposure to the winners and avoiding the losers. Today, a strong case can be made for the S&P 500 to drop all the way to 600 and our approach takes that into account. 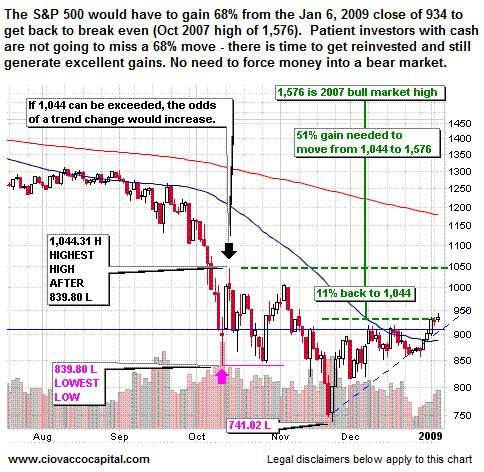 A reasonable case, especially from a technical perspective, can also be made for the S&P to rally back to 1,150. Even if we drop back to 600, the path could be to move from 930 to 1,150 and then back to 600. Realistically, we have no idea how long such a round trip could take. Stocks and other assets could rally for a year or two and then plummet to new lows. If we stick with an open-minded and disciplined approach which relies on what is happening rather than what we think will happen, we will never stray too far off course. These are not subjective statements based on my opinions. These statements are backed up by research of how to make money in the financial markets. There are numerous books available which describe common and successful approaches to money management. Again, if you want to improve your results, worry much less about what you think may happen and pay attention to what is actually happening. Our objective in the investment markets is to make money. The objective is not to show how smart we are by anticipating and correctly forecasting the direction of any market or asset class. Our fundamental and technical research does help us assess the odds of any particular outcome. Odds involve probabilities; probabilities of being right and probabilities of being wrong. Assessing the odds is important, but paying attention and reacting to observable changes in both the technicals and fundamentals are more important. To repeat from the opening paragraph, our focus is on mastering proven and repeatable methods which can improve our odds of investment success. If you do your own research on proven investment methods that are effective in bull and bear markets, you will find little or no emphasis placed on forecasting. In 2009, try to stop using phrases such as “I think”, “he thinks”, “they forecast”, or “I just can’t see that happening”. See if you can replace them with “we’ll see how things play out”, “the odds favor”, “there are a lot of moving parts, we could be wrong”, and “we are prepared for and open to numerous outcomes.” The best way to “forecast” is to observe current trends and expect them to continue until you observe evidence to the contrary. Currently, the observable trends remain negative. We have seen enough positive observable evidence to get our attention, but we still need to respect the prevailing downtrend while keeping an open mind about a possible change of trend. If capital needs to be deployed in the coming days or months, we stand ready to take action. Economic fundamentals remain weak. Valuations are moderately attractive. The technicals are weak but showing some renewed signs of life. On many fronts, we see what appears to be a gradual reduction in risk aversion. We may also be seeing a little less fear of deflation and more concern about inflation. Asset prices tend to bottom between one and six months before the economy. We must allow for the possibility of investment gains before we see an economic improvement. The fear of missing a bottom may also be a catalyst if the recent gains and technical improvements can continue. Money is being created out of thin air and pumped into the economy. Investors should pay attention, keep an open mind, and be prepared for bullish and bearish outcomes. It is entirely possible we may be past the point where everything goes down. Some assets may begin to separate themselves from the pack in 2009, which means there will come a time to put some more capital to work. The chart below of the S&P 500 may help with the fears that we "are missing something" holding onto cash as the market makes "big gains" off the November 2008 lows. If you look at the percentages, these "big gains" have barely put a dent in the real losses that buy and hold investors have experienced since the market peaked in October of 2007. There will be plenty of time to make money when the odds shift back into our favor. These same concepts apply to almost all markets and all asset classes. When oil finds a bottom, we can afford to "miss" some of the early gains and still have an opportunity for excellent returns. We are in a deflationary environment where principal protection remains the primary objective. A safe haven for the majority of your investment assets must be maintained until the deleveraging process has run it course and some semblance of order returns to the financial system. The severe dislocations in the economy and financial system will not be repaired in short order. Problems in the housing, credit, and financial markets are significant and cannot easily be corrected with government policy or intervention. As a result, even a well thought out investment approach using multiple asset classes must be adjusted to align with vastly different conditions. Credit events of this magnitude are very rare and thus are not easily addressed with even the most elaborate diversification strategies, including those developed by CCM. Our willingness to raise cash very early in this cycle and not blindly rely on asset class diversification shows we understand the state of the financial system and are willing to make the necessary adjustments to our investment approach and models. We have made adjustments and will continue to do so if conditions warrant. Actions already taken by policy makers and those being proposed by the Obama administration are sowing the seeds of future inflation, possibly severe inflation. Contingency plans mush be in place to deal with the possibility of rapid changes in market participant’s willingness to take on risk as they transition from the well-founded fear of deflation to the well-founded fear of inflation. The transition of markets from a deflationary bias to an inflationary bias may take place at a surprisingly rapid rate. Contingency plans must be developed from a strategic perspective and implemented with tight risk management controls and proven tactics. Plans must include the almost inevitable need to protect the purchasing power of your assets at some point in the future. While we would prefer to maintain a fully invested position using multiple asset classes as a source of diversification, current conditions necessitate a different and more flexible approach. If deflation continues, the five major investment themes covered in this outlook may be of little value. However, if and when inflation begins to rear its ugly head, they will represent a good source of ideas to assist us with preserving the purchasing power of our assets. The technical screen below was compiled from literally thousands of investment options. It tells us at the present time many investors are concerned about future inflation (green & orange boxes). Economic weakness has been acknowledged via the heavy interest in the boomers/consumer deleveraging theme (yellow boxes). The frequency of results related to the infrastructure & government programs theme (see blue boxes), also points towards "big government" and massive amounts of deficit spending. Finally, the interest by market participants in the economic shift to Asia theme (purple boxes) also ties into concerns about U.S. inflation and the possibility of a weaker currency. The rankings below are one way of "listening to the market." The rankings also are an example of paying attention to what is actually happening rather than what we think may happen. We will use the list above as part of our watch list for 2009. For each investment, we have identified several price points above current market prices where we would consider taking some action. If the investments cannot move through these price points (meaning they are not going up), we will remain patient. Now that we have completed the foundation for 2009, we will look more closely at the merits of specific investments. We’ll keep you informed of our thoughts and plans.